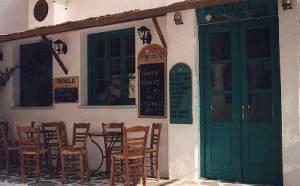 Naxos Ag. Anna Taverna across the beach. Agia Anna is a resort developed in the last few yeas some 6 kilometers (4 miles) away from Naxos Town to the south. Newly-built apartment complexes will accommodate a wide variety of tastes. It is a quiet area, so don’t expect much “action.” It offers swimming at two wonderful beaches some 300 meters of length, which, like the best ones on Mykonos, are open to the south, thus well protected against the prevailing “meltemi” north wind. A country road runs alongside these beaches, with all kinds of small shops, covering the needs of the vacationer's. The traffic is not heavy, but, at times, can be somewhat noisy. There is frequent bus connection (by Cycladic standards!) to Naxos Town, in case you do not wish to hire a car or a motorbike, which would be a pity, given that the island is so big, with so many interesting places to visit. Hiring a bike would extend your stay in Naxos Town far beyond the bus operating times which are, but in peak season, quite tight. This totally revamped four-star accommodation now offers 25 elegant suites at the pretty sandy beach of Ag. Anna, about five kilometers south of Naxos Town.